The Pakistani military and its spy agency, the Directorate for Inter-Services Intelligence, have an expansive menu of options before them in their endless campaign to subvert democracy. And subverting democracy (as opposed to, say, winning wars against India, or helping the U.S. defeat the Haqqani terrorist network in Afghanistan) is the real specialty of Pakistan’s military. On many occasions, the intelligence service, known as the ISI, achieves its goals through sheer brutality. Such was the case in the beating death of Saleem Shahzad, a Pakistani investigative journalist, in May. His murder was sanctioned by the ISI, according to Admiral Mike Mullen, the just-retired chairman of the U.S. Joint Chiefs of Staff. 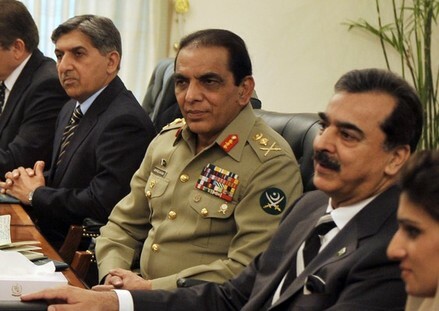 In a recent article in the Atlantic, Marc Ambinder and I reported that U.S. officials saw intelligence showing that officials in the office of General Ashfaq Kayani, the head of Pakistan’s army (and the most powerful man in a country ostensibly led by a civilian president), ordered the head of the ISI to “take care of the problem” posed by Shahzad. His body was soon found on the bank of a canal. On other occasions, the ISI executes its mission with slightly more politesse. Such is the case in a controversy now raging around the alleged activities of the Pakistani ambassador to the U.S., Husain Haqqani. He stands accused of something akin to treason for allegedly trying to enlist American help to undermine the Pakistani military’s hold on the country’s elected government. Haqqani (no relation to the Haqqanis of terrorism fame) has long been known as a pro-democracy activist and a critic of the army’s meddling in Pakistan’s civilian affairs. As a scholar (he was a professor at Boston University before taking his current post), he wrote the definitive book on the Pakistani military’s unholy alliance with jihadists, “Pakistan: Between Mosque and Military.” Haqqani was appointed ambassador to the U.S. in 2008 over the objections of the ISI, which has been gunning for him ever since. This is an absurd campaign for the ISI to wage: Haqqani is one of the few Pakistani officials who have any credibility in Washington, and he has carried water for the ISI numerous times. Self-destructive behavior, however, is also an ISI specialty. Last month, the Financial Times published an op-ed article by Mansoor Ijaz, a Pakistani-American businessman. In it, Ijaz claimed that he had helped deliver a memo, ostensibly on behalf of partisans of President Asif Ali Zardari, to Mullen, asking the chairman to help curtail the Pakistani military’s power in politics. (Mullen later said he ignored it.) The article intimated that Haqqani was behind the memo. Ijaz keeps turning up in the most unlikely places. In the 1990s, he has said, he was involved in discussions in which the Sudanese government offered to deliver Osama bin Laden to justice, a claim denied by Clinton administration officials. In 2006, he suggested that he knew of evidence that Iran had already produced a nuclear weapon. But the ISI apparently sees him as very credible. And they found in his op-ed a chance to move against Haqqani. The spy agency quickly fomented an anti-Haqqani campaign among the more pliant of Pakistan’s newspapers (the ISI is also known to keep journalists directly on its payroll, which is a timesaver for its media-manipulation department), and Zardari was forced to recall Haqqani to Islamabad. Haqqani denies drafting the memo, and has already offered to resign, in order to protect Pakistan’s civilian president. He also raised some obvious questions about Ijaz and his motivations. Ijaz says he is a critic of the ISI and claims to be opposed to military rule in Pakistan. Yet, according to reports in the Pakistani press, he recently met with General Ahmed Shuja Pasha, the head of the ISI, and turned over his BlackBerry. Ijaz’s behavior suggests that he is either an epically erratic operator or someone who from the outset was attempting to subvert Haqqani. It’s not at all clear how this scandal (known as “Memogate” in the obsessed Pakistani press) will end, but if it results in Haqqani’s removal as ambassador, it would be a minor tragedy for an already tragic country. Military rule has brought Pakistan nothing but violence, stagnation and political repression. Many Pakistanis see the Haqqani network — the pro-Taliban terrorists who are killing American troops — as a more serious threat than a pro-democracy academic. But as long as the military and the ISI are in charge of Pakistan, the wrong Haqqanis will be ascendant. MM I liked your choice of caption. Whether it is your choice or you have borrowed it from someone else. Yes, Rex non potest piccare, though said to be a medieval concept but is it? All the clandestine wars going on globally have their own secret stories to tell. Only the listeners have become scarce and scared. Truth has been dubbed by a few rogues. How many people do we need to scare a mob of millions? Perhaps a few with their lethal designs, are enough. Today suddenly for past few weeks, there is a sudden spurge of anti-Pakistan propaganda in the Western US controlled media. Whenever there is a talk of action against these Islamic terrorists sponsored by the state official machinery – ISI/Pak Military; it is only in favour of US/Allies, but those acting against India are left lose to run amok. India cannot sit as a mute spectator. non potest piccare, who will speak against such a treacherous Rex?